Having the mind and will focused on a specific purpose. This is body, mind and spirit as one. 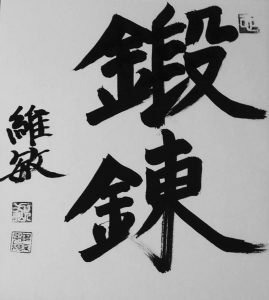 In relation to budo, true intent focuses the spirit through the body, incorporating our will free from our mental attachment, true intent becomes the physical expression of mushin or no mind, in action it is the physical representation of Wei wu Wei or acting without action/attachment. True training in budo is to achieve this state. 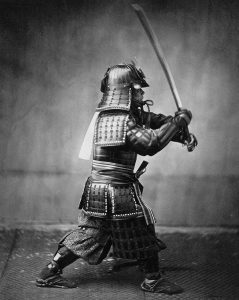 The greatest adversary in budo training is not a sword wielding psychopath, but rather our own ego self or deluded self nature. In creating an environment that is the modern dojo, in particular one that trains with modern attitudes and thought values based on intellectual analysis, fear of litigation, insurance indemnity issues and a modern predisposition to attaining everything in the fastest and easiest way possible, the ancient and proven methods that were used to destroy the ego to find the true self nature, have all but been abandoned. It is not possible to intellectualise enlightenment, it has to be experienced. True budo can not be taught, the heart teachings can only come through self realisation. In budo the way to experience this is through training to the point that the self is forgotten, the ego is banished and action happens spontaneously from the subconscious mind. It helps to realise that the true warrior does not have fighting mind, and values compassion and honour above all things, and paradoxically seeks to attain peace within the study of seemingly non peaceful actions. Their ultimate goal is the cultivation of benevolence, love that transcends human emotions and exists in the heart of God. For without benevolence, the greatest of emotions, the warrior is nothing more than a tool for warfare and destruction. Excessive as some may see it, the true understanding of shugyo (aesthetic or arduous training) in the context of budo as a way to elevate the spirit was essential in a “way” (Michi) that uses kinesthetic learning processes, repetitive body movements to the point of exhaustion and feats of human endurance to attain a desired outcome. As a path to enlightenment I don’t think that the study of budo is for everyone. There is nothing easy about repetitive hard physically demanding training. Constant introspection and self analysis in the context of budo is a difficult thing to achieve, as it is easier to look outside for the truth that is actually inside, hidden deep beneath layers of self righteousness and self importance. Budo is, after all, complex physical exercise. Issuesarise when a “way” has a spiritual or philosophical side that is supposed to be understood through the forging of the body to release the ego, but is usurped by intellectuals that refuse to acknowledge the truth or benefit of the ancient ways of training. They attempt to teach a path that has been trodden by another without actually following the steps and actions of the teacher that lead them to a state of higher conscience, in essence they try to shortcut a process to enlightenment. Unfortunately, this path is relevant only to the individual that walked it, and is not a blueprint for any other person’s life. Truly, the saying ” not to seek to follow the great teachers of the past, but seek what they sought” is very relevant to true budo. 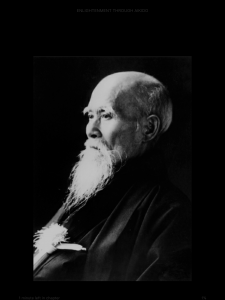 They also deny the benefits of shugyo to a “modern” man in a “modern” society and hide behind long winded discourses that are nothing more than plagiarism from enlightened human beings that themselves understood the value of shugyo, and applied these techniques with great vigor to overcome the self formed through learning based on accumulation of knowledge and the creation of the ego. To train in this way is to train in true intent. The process of Tanren (forging) laser focuses the mind and gives rise to an intent that pierces through all delusion, to see the truth of all things is to do all things while disregarding the discriminating mind. A mind free of duality produces intent that is unable to know defeat, as being free from duality, life and death cease to exist. No human can control another, but through true intent, the space between the two is occupied by the absolute, therefore the space is controlled and the outcome decided before movement arises. True intent is not exerting your will or desire on another. The moment desire arises in the mind, attachment arises and the mind is defeated. You cannot attack wrong mind with wrong mind. This is utilising the same mind, and creates a state of aiuch, mutual death. As the true essence of mind spontaneously emerges , it is unable to be controlled by the attacker, as no person can grab another’s mind. With true intent comes action free of the process of desire, the interaction becomes a single moment, and technique is banished to past tense. Technique becoming the end result of the interaction rather than the precursor to action. As such, the shape of the body follows the natural shape of true intent, if this occurs it is impossible for the attackers intent to occupy the same space and time. This is the essence of “to cut with a single beat”. Technique free of desire and human will, initiated with true intent is the highest level of budo, and the reason that shugyo is absolutely necessary if we are to transcend the mundane and overcome the ego. If true intent comes from true nature then it cannot be anything other than an expression of the universal truth of unconditional love.